Millie Rowe's baking dream is looking sweet. 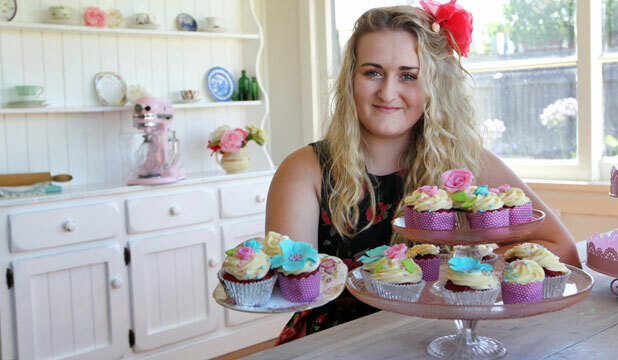 The young baker and cake decorator, of Timaru, has secured herself a scholarship from Southern Hospitality and an apprenticeship to work in Scotland. While her scholarship will not take her far from home, her apprenticeship will: to the other side of the world, to work at Scotland's acclaimed Fisher and Donaldson bakery in Fife. Millie's scholarship will put her through a patisserie course at Aoraki Polytech in July, before she travelled to Scotland in January. But for now, her main priority is raising the money to go. To do that Millie, 17, has been making cakes to order and already, her small business venture is proving profitable. A fortnight ago she raised $1500, after costs, selling 400 cupcakes on the streets of Timaru in celebration of Valentines Day. The young entrepreneur said she has no regrets leaving school at the age of 16 to pursue her career.